VisiVite AREDS 2 PLUS+ Gold Formula® exceeds the National Eye Institute's newest recommendations for macular degeneration. Exceeds AREDS2 formula. Brand name FloraGLO Lutein and OmniXan Zeaxanthin. All USA-sourced ingredients. Requires only two capsules per day. Natural Vitamin E.
Requires only two capsules per day. VisiVite's best-selling ocular supplement. Based on AREDS2, but with 50% more lutein and 138% more zeaxanthin. Compete mixture of additional powerful antioxidants. No synthetic ingredients. No artificial color. Natural lutein and zeaxanthin. Premium vegetarian capsules. Excellent Product ! Areds 2 Plus Strongly recommend !! Simply put.... Visivite products WORK !!! I was diagnosed with ' Dry AMD & Early " Thank God !!! Immediately ordered Visivite AREDS Gold and within approximately 4 months it was " stabilized ", to quote my Ophthalmologist back in 2010. He asked me what I was doing, said to keep it up and also recommends Visivite Products !! Keep up the GOOD WORK FOLKS !!! Vision is something that is so important ! The cost is reasonable and gets better with the more you order. Take if from me.... YOU WILL BE GLAD YOU DID. I have been taking VisiVite Areas 2 Gold for more than five years. This product was recommended by my ophthalmologist who diagnosed me with Macular Degeneration in my right eye. I am happy to say that since taking this product, there has been no progression of MD. I see my doctor every six months and my condition remains the same. Although VisiVite does not reverse the MD, I do believe that it has been effective in slowing the progression. I converted to Visivite Areds 2 Plus around 2 years ago. 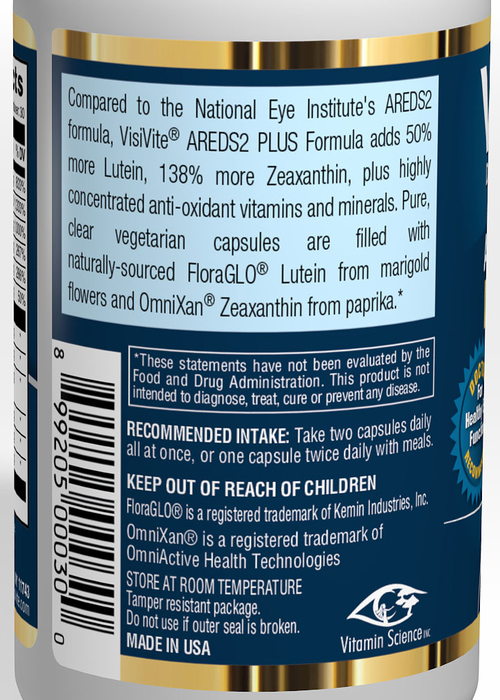 My regular eye doctor found early onset of Macular Degeneration, dry type and recommended I start using AREDs 2 formula. I began with a popular over the counter variety and then found out about VisiVite. I switched and began using it 2x daily. I see both my regular eye doctor and a Retinal Specialist he put me in touch with. Both doctors indicated that my Macular Degeneration and cataracts have stabilized and have not gotten worse in the past year since my prior visits. That is great news and shows the vitamin therapy is helping. I am very pleased and recently my regular doctor said that with glasses rx my vision is still 20-20. Thank you. Three years ago during a routine eye exam the optometrist noted my husband had some changes that indicated the beginning of Macular Degeneration. He recommended that my husband start taking some eye vitamins and that monitoring the continue would be the best approach for now. I researched many eye vitamins, read labels and came across VisiVite. I read the literature and decided to use this product. Each year since then my husband's eye appointments have gone well with no changes or progression of the Macular Degeneration. The doctor is pleased and we are certainly pleased. These are the only eye vitamins my husband uses. I am totally satisfied with this product. My macular degeneration has not progressed for at least 5+ years (can't remember when I started taking them). My eye doctor is very pleased. I like that it's made in the USA. I have been taking your VisiVite AREDS Gold since about 2006 and also Resiva resveratrol for a few years. Amazing products. I was noted in your "Sight for Life" brochure 7 years ago, with a full page picture holding my great grandson. My eyes still remain almost unchanged since starting with VisiVite. Merchant Response:Thank you again, James, for sharing your good news. I have been taking the Gold for 2 1/2 years and at my last doctor's visit, he told me my macular health had improved. He didn't mention any sign of AMD like he had noted at my previous visit. Merchant Response:Thank you for sharing your great news with us, Judith. Hearing that we are maintaining eye health in VisiVite users like yourself confirms the wisdom in our goal to provide quality nutrition without compromise. My optometrist noted perimacular drusen in my eyes several years ago and then told me about AREDS and VisiVite supplements. I ordered the recommended formula and began taking them twice daily as recommended. Within a year, my optometrist noted that there had been no progression of the perimacular drusen, a precursor to macular degeneration. In fact, he said that there may have even been improvement. I've had several annual eye exams since then and there has been no indication of macular degeneration. Easy to order, prompt and efficient delivery and affordable ! 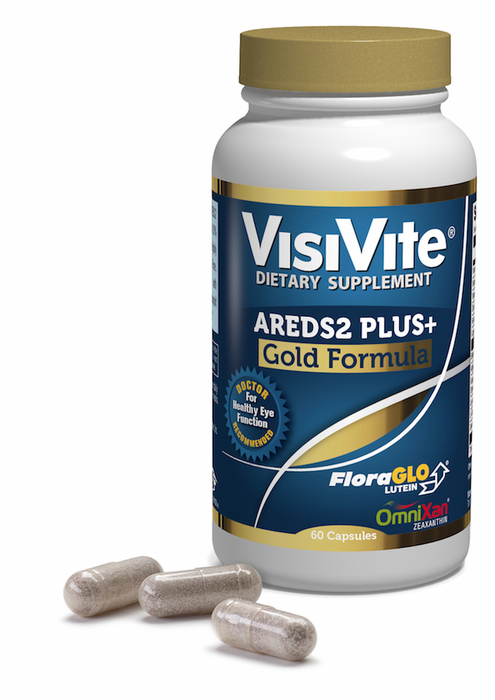 AREDS 2 PLUS+ Gold Eye Vitamin Formula. Great product, husband really pleased with the results, he has age related macular degeneration and it's keeping it in check. Many thanks. Someone else has done all the work! I feel confident that VisiVite Gold is helping me keep my macular from advancing according to my retina physician!!!! 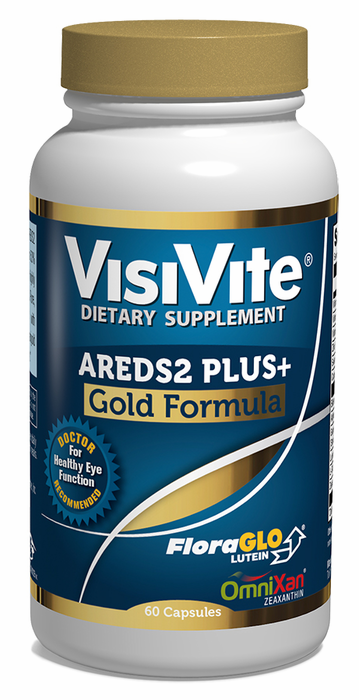 I have been using VisiVite AREDS 2 Plus Gold Eye Vitamin Formula for many years. The reason I decided to use this particular AREDS is because of the ingredients in this formula. 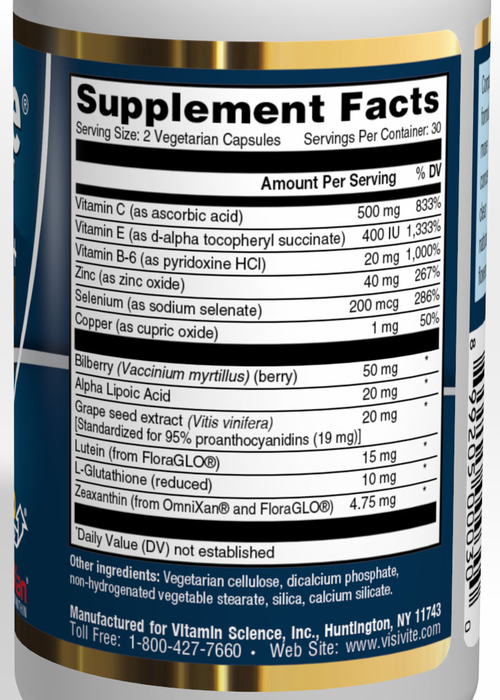 It has more Lutein and no soy products compared to other vitamins. The capsules are vegetarian. I have been using this eye supplement for over a year and am pleased with it. My macular degeneration has not progressed, and that's a big relief! ProsThe price is better than Amazon when I buy it from the visivite website. ConsHowever the seal on the bottles could be made more secure. This continues to protect my husbands eyes as he fights for his sight against histoplasmosis. One eye lost early on but other eye still good. has slowed down the progression. At each visit to my ophthalmologist, I'm told to keep doing what I'm doing! I've been taking AREDS 2 gold and Reviza for 4 years. No changes have been detected in my macular degeneration! I have recommended your products to relatives and friends! In 2014 I had both Cataracts removed. One in the Public Hospital under which was free, however the other eye didn't quite meet the requirement, but on my surgeons recommendation I had the other one done shortly after in a private hospital which I paid for. The same surgeon did both ops. It was my surgeon on a follow up visit that recommend Visivite and I'm been taking them ever since. My eyesight has been stable since being diagnosed 21/2 years ago. At my last visit with a scan being done, my ophthalmologist said, whatever you are doing, keep doing it. I give the vitamins credit! I have used Visivite Gold for nine years now and have maintained my sight in that time. I have not missed a dosage in nine years. I would recommend your product highly to anyone with vision problems. My doctor has actually recommended this product because of my success. Macular degeneration blinded my Dad and his sister. When my ophthalmologist told me I was developing M.D. I started researching which vitamin formula was best and this one was far ahead of any of the others. This was also about 5 years before the ophthalmology association began recommending AREDS2, Visivite was surpassing today's standard even then an still does. So far, my M.D. has not progressed and I thank Visivite for that. ConsSometimes are difficult for me to swallow. I would rather take 2 smaller capsules than 1 large capsule.